Our vision is to remain an exceptional service firm consisting of the most qualified professionals with strong communication skills and a core commitment to the firm, its mission, and its clients’ overall success. Contact us today at 310-887-1313 for your free consultation. 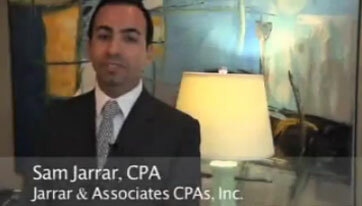 Jarrar & Associates CPAs, Inc. is a dedicated member of the American Institute of Certified Public Accountants. Many of our loyal associates and professionals serve in volunteer capacities on professional and technical committees and organizations. We believe the most critical element of any CPA firm is its people. In an effort to continually maintain the professional excellence of our firm, our principals and professional staff complete a minimum of 80 hours of Continuing Professional Education (CPE) every two years. CPE courses include study programs in areas such as auditing, taxation, advisory services, ethics and communication.